This minimally invasive orthodontic treatment uses clear, plastic trays, rather than brackets or wires, to shift the teeth toward a more attractive and healthful position.Invisilign can help correct imprefections such as as uneven spacing, overcrowding, and a misaligned bite. Many adults are under the impression that it is too late to fix their smile or they are hesitant to wear traditional braces. We want you to know that it’s never too late to get the smile you deserve.If you are unhappy with the appearance of your teeth, contact Adelaide North Dental Care to learn more about how Invisalign® can shift your smile, and your life ! 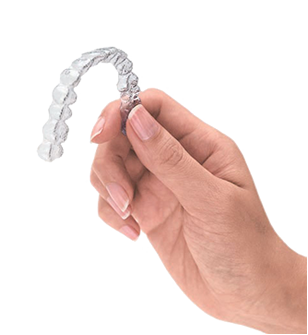 Invisalign® is an advanced orthodontic system that uses a series of clear, removable plastic trays to gradually guide the teeth into their optimal position. Many adult patients who are experiencing mild to moderate spacing between the teeth do not want to wear traditional metal braces , as they can be conspicuous and uncomfortable, and they falsely believe that there are no other treatment options. Invisalign® gives these individuals a chance to obtain a beautiful smile without discomfort, frequent dental appointments, or feelings of self-consciousness. After taking impression of the teeth using our state of art digital scanner ITero, we will send the impressions to Invisalign® labs where customized trays will be created. Patients are expected to wear the Invisalign® trays for 22 hours a day, removing them while eating and drinking. Each tray is worn for a few weeks at a time, until the series is complete. Typically, treatment with Invisalign® can be completed in one year. During a comprehensive evaluation, we can elp you determine if Invisalign® is right for you. Invisalign® offers distinct advantages over traditional braces.While many people are attracted to Invisalign® because of the cosmetic results that can be achieved through its use, we are most pleased to provide this treatment method because it can drastically improve the health of the smile as well. We have helped countless patients feel better about themselves by providing treatment to give them the vibrant, healthy smiles they deserve. If you suffer from gaps in your teeth, overcrowding, or bite misalignment, Invisalign® may be the solution you need.